There is a growing trend in the news – dubious online stories with stock images, no real detail, and an outlandish yarn that will pull in the punters. Yes, you can always trust the Daily Mail to have the stories you really want to read … which is why it’s one of the most popular news sites in the world. 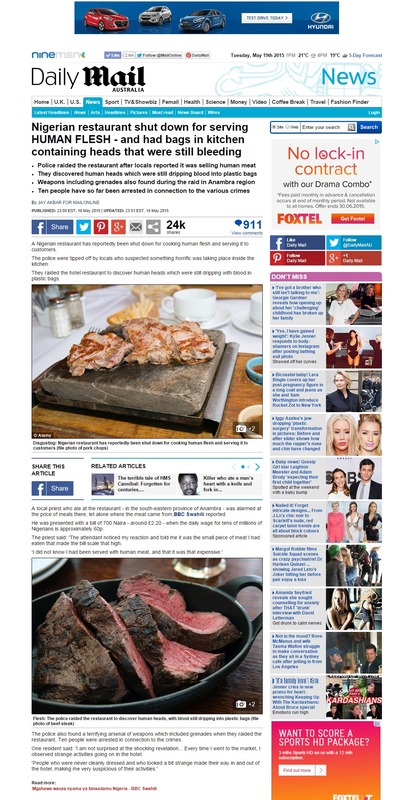 And when the Mail finds a scoop, its rivals at News.com.au are rarely far behind . 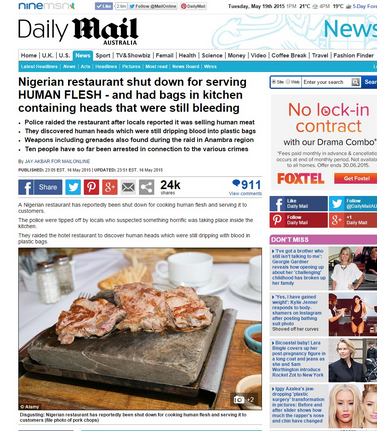 When police raided the restaurant they discovered human heads that were still bleeding with the blood draining into plastic bags. You would not believe the things that happen in Africa. And if you looked at this story—which was gobbled up by the media across Australia, Britain, America, Africa and Asia, there was plenty of reason to doubt if it was true.